The end game for many social investing sites is to create their own investment management products that link member’s brokerage accounts to the trading data generated by the top portfolios on each site. Today, Covestor is the first major social investing site to launch a stock trading product. 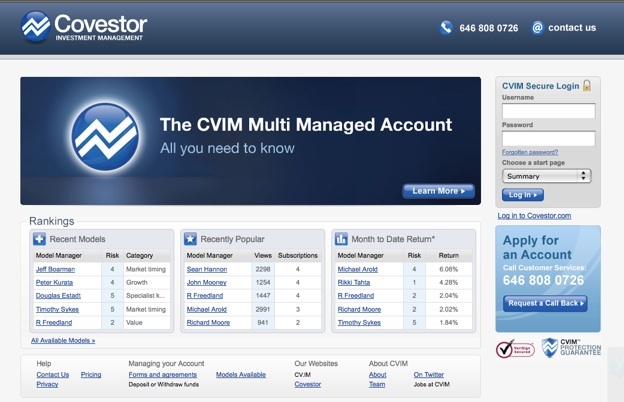 It is called Covestor Investment Management (CVIM). Covestor had to become an SEC-registered investment adviser (like competitor kaChing did last December, although kaChing still has yet to launch an investment product). Covestor has seeded CVIM with ten of the top traders on its site, representing a variety of investment styles from growth to value to market timing. Most are amateurs, but there are a couple registered investment advisers and one accountant in there. You can see their portfolios on Covestor, but the ones they trade on CVIM are different and you get only an aggregate view of their returns and top holdings. Once you subscribe to them, you get a full detailed view. What Covestor is actually selling is investment data. 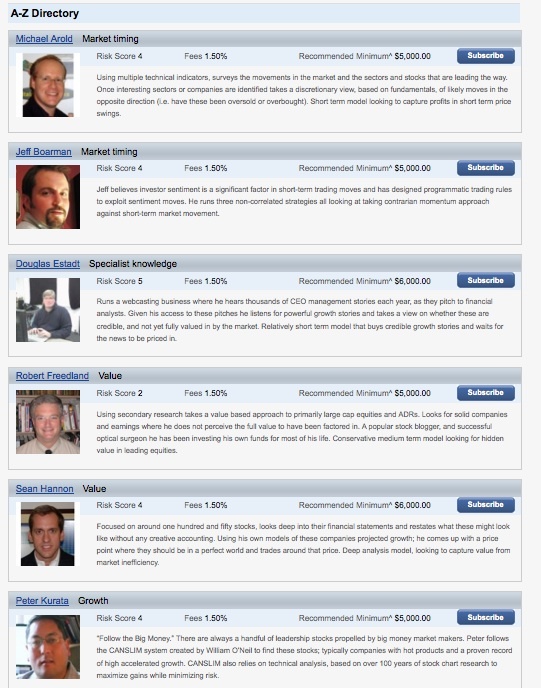 Each of the ten “portfolio managers” are trading for their own accounts. They never hold any of your money. CVIM merely links their trading data to a brokerage account you set up either with TD Ameritrade or Interactive Brokers. You select which accounts you want to follow, and CVIM automatically instructs the linked brokerage account to mimic the trades in proportional amounts. Covestor charges a management fee of about 1.5 percent of your assets being managed, or $12.50 per month (whichever is greater), which it splits with the investors being tracked. You also end up paying the fees for each trade to your brokerage (up to $17 per trade). With a mutual fund or hedge fund you absolutely pay per trade. It is another transparency issue. The mutual fund does pay commissions, they pay fees to the broker that sells stock to them it is just you don’t know how much commission they paid as it is reflected in your own performance. In other words they may have bought a stock at $11.25 but it will appear as if it were bought at $11.13. They wrap the commission into the cost of the security/securities. In the end, nobody is going to care about the fees. It is the performance of each portfolio that matters. I’m not convinced that really good amateur investors can do any better than professional investors. Over time, they nearly all get beaten by the S&P 500. If you take a look at how each of the ten Covestor “model managers is doing, some are beating the S&P 500 this month, but none are beating it over the past three months. I’d definitely want to see some outperformance before I put any money behind these guys. But I like the fact that Covestor is leveling the playing field for smart investors to virtually manage funds and compete with the institutional establishment.